So here is the page devoted to tying together the pieces of the open mic adventure that I have lived in Belgium since I first started. At each subsequent Formula One race that I visit this year, I will add a new such page. Keep posted…. Yes, yes, for those who are very alert, you might realize that I am writing these words from Monza, Italy, that Belgium was the race I attended two weeks ago. I admit, I am behind schedule on this one by one race – but the Italy section will be done pronto!!! I had just reached the conclusion that I would finally have to admit defeat here in Liege. For the first time on my worldwide musical adventure this year I thought I would have no chance of finding an open mic or open jam session in the country where I have been sent to work on my job as a Formula One journalist. Oh, there was the possibility of packing my bags and going to Brussels tonight after the race, but the weekend had been so hugely packed with unforeseen events – read, the broken down car – that I did not really want to do that. Enter my friend Sofiane Hamzaoui. It was, in fact, another one of those cases of how this worldwide adventure now in its fourth year has expanded, grown and blossomed as I pick up friends, contacts and musical acquaintances around the world and get a better and better understanding of the musical venues and vibes in each place. I had met Sofiane at a place called l’Art Cafe where I had jammed on a previous trip to Liege, and we had remained in touch through Facebook. Recently, in fact, Sofiane and I learned we had even more in common than just music, as he told me about his documentary film about metal music that he has just completed and for which he sent me a link on YouTube. I thought he did a fabulous job and enjoyed it immensely, so I’m sharing it here. But the big news yesterday was that suddenly Sofiane said he thought he had the answer to my problem of trying to find a place in Liege to jam. 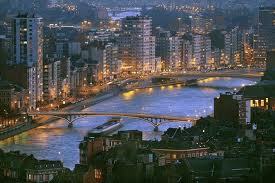 It had turned out, by the way, that all the places I went to in the past in Liege are closing down. I arrived on the doorstep of the great Bouldou bar on Thursday to find it blacked out and boarded up and out of business. L’Art Cafe had already closed down when I came last year, as have other venues. But Sofiane told me of a new jam taking place near the Art Cafe ruin, and which runs on Saturday nights. He said he knew the drummer who is one of the organizers, and he gave me all the information, and I went and found not only that the event was indeed running – minus the drummer, who was ill – but that it was also being run by the former owner of the Art Cafe, David, who is also a guitar player. The venue is called El Cuba Libre, and it is located at 7 rue St. Leonard, and is owned and operated by the friendly and music-loving Franco. Don’t worry about the name of the bar, the music crosses all styles, mostly rock and blues, and has nothing to do with Cuban, or Latin, music. The jam has existed only around two months, but the bar has been around for more than a decade. Both Franco and David told me that bar after bar is closing down in Liege due to the financial crisis, and also due to new anti-smoking laws that are making life difficult. Franco had never held a musical event at his bar, but he is now apparently addicted. Check out the podcast I did with him and David, another in the series of podcasts that I have been doing this year. I was delighted because not only did I hear some great music and play with some cool musicians, but I also continued on my goal of recording myself playing with local musicians in every country I visit this year – all 20 of those. Once again, just as I felt like I was ready for failure, I found myself persisting and getting lucky. It was all thanks to Sofiane – there was no web presence for this new jam or for the bar itself – check out his documentary, and if you have any ideas on how to get it distributed or sold to a TV station – send them in. Another night of negatives in Liege, as one of the city’s main jam session bars was closed for the summer – and opens in a few days from now. It was my second night in the Belgian city and the second night that I found jams closed for the summer, closed for good. I couldn’t take it. So I took my guitar down to the river Meuse at midnight and played “Mad World,” on a walkway as late-night pedestrians passed by clapping and stomping to the rhythm. It is indeed a mad world. Actually, I played four songs. It’s too difficult to go more than a day or two without music, and it was too late to play at the hotel. The Friday night jam takes place at a bar called the Surlet, and is apparently one of the best in the city. Since I began this worldwide open mic adventure, I have always worried about the fact that a number of races happen during a period that many bars use to close down for the summer holidays. Fortunately I have never until now been affect by it. But since there is nothing left in Liege, I decided that I will go to Brussels for my final night in Belgium, tomorrow night. I know there are at least two jams there. P.S. At 1 AM I decided to take my unicycle in go for a spin down the same walkway where I played – along with a few other late-night cyclists. It rained, of course, but it was easy to ride with the umbrella.